I moved here in April 2005 after a year of exploring a number of coastal communities after making the decision to relocate from Boston. It’s inspired me to focus on relocation in my real estate business, and to create a series of short videos on my YouTube Channel on relocation tips and advice. Most people here say we live in paradise. I can’t argue with that, with average high temperatures in Carlsbad ranging from 64 to 75 degrees, and average lows from 51 to 64. It can get colder at night in the winter, and during the summer or fall heat waves can hit the 80s or the 90s when the Santa Ana winds blow. We occasionally complain about humidity but it does not compare to New England, or Washington DC! I know, I’ve lived there. As everyone knows rain is kinda rare here, and we are often in a drought, but when it does rain it can be pretty significant, and cause some flooding and landslides in some areas of SoCal. We can go for months without rain, usually starting in April! But what’s really nice about our weather is you can enjoy an outdoor lifestyle here year-round. I go barefoot almost all the time (except of course with clients and when out in public places other than the beach!). Yes, we have the marine layer – we call it May Gray and June Gloom, although it can happen at various times of the year. It’s more common near the coast, and while it can linger, some days when it occurs it burns off very quickly. Sometimes it’s just gray skies but we get ground fog, too. One of the particular things I love about Carlsbad, as an art collector and former art gallery owner, is the breadth and depth of performing and visual arts. Carlsbad has a good reputation as an arts community, with a variety of public art including statues, sculpture, and wall murals. Carlsbad created their Art in Public Places Program in 1985, which was the first program of its kind in San Diego County. The city-owned Cannon Art Gallery is a true treasure with multiple exhibits throughout the year, all free. There are opening-night receptions and open studios for residents and kids. The Carlsbad Sculpture Garden by the main library near the Village, with changing exhibits, is another wonderful addition to outdoor Carlsbad art. There are a number of galleries, and multiple 1-day arts and crafts fairs in the Village. The TGIF Concerts in the Parks are very popular, with 9 free concerts in the summer at 4 of our prettiest parks in June, July and August. The New Village Arts Theater in Carlsbad Village offers regular stage performances throughout the year. Clients, especially those who are relocating here, often ask me about the things to see and do, and it’s been fun discovering all about Carlsbad in the last 13 years. You will never run out of things to do, although of course you can just sit on the beach and do nothing…does that count? Here’s a “short” list of some things to do. And check out my 365 Things to Do in Carlsbad Facebook page. 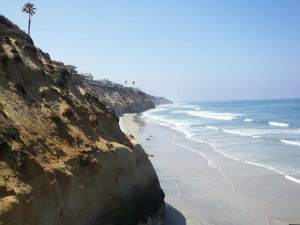 Carlsbad had 7 miles of beach, from the Oceanside border at Point Malo and the mouth of the Buena Vista Lagoon, south along the Coast Road/Historic Route 101 (video tour) to Encinitas. There are lots of different beaches by name (e.g., Terramar, Warm Waters, Hole in the Fence, South Ponto, Frazee, Tamarack, Jetties, Carlsbad State Beach), but it’s hard to tell where they start and end…and who cares anyway. Some people refer to different beach areas by the numbered life guard shacks (20 to 38). Carlsbad beach life is pretty special, whether you just like to sit on the sand and ponder the universe, watch the sun set, take walks, and enjoy dining al fresco, or be more active with surfing, boogie boarding, stand-up paddle boarding, beach volley ball, wind surfing, running, kayaking, and more. We have yoga classes on the beach, or you can attend surfing school if you’re just getting started! Public access to the beaches is pretty good, but be aware that there are places further north past South Carlsbad State Beach where you will need to take stairs. While the majority of parking along the coast road is free, there are some pay parking lots at the state beaches (north and south end of Carlsbad). You will also find parking in the residential areas across the road from the beach although it may be limited. Does parking get crowded? You bet, especially on weekends and during the summer. But walking a little ways from your car to the beach is worth it, and anyhow it’s good exercise for you? As a Carlsbad Realtor I am particularly interested in the wide range of housing styles and prices, from bungalows to condos to oceanfront estates, with prices (as of this writing) ranging from $100,000 for a manufactured home near the beach to $29,950,000 for a spectacular oceanfront estate (here’s the March 2018 Carlsbad market report). There are gated and ungated communities, million dollar tract homes, new construction (condos, town homes and single family detached homes), affordable housing (for purchase – it’s limited – or for rent), plus varied housing communities for seniors only (rentals, purchases, assisted living, memory care, skilled nursing care). It doesn’t matter if you want a primary home, a vacation home, or an investment property, you will likely find it here in Carlsbad. Prices are high relative to other parts of the country,and have been rising since the recession, but for coastal living in the San Diego area, Carlsbad homes represent terrific value compared to neighboring communities to the south. And it’s a bargain compared to LA and San Francisco! Have questions about life here in Carlsbad? Give me a call (760-840-1360) or email me at JeffDowlerSolutions@gmail.com. And if you are interested in buying and/or selling a home in Carlsbad, we should talk. The Spring market is here!